Swoonworthy. Romantic. Smoking Hot. Find your happily ever after in this limited-time boxed set from TWELVE bestselling authors. Modern day Cinderellas, handsome royalty, and business empires run from glass skyscrapers! 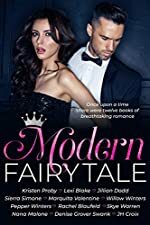 MODERN FAIRY TALE is a limited-time boxed set as a gift to our readers and to introduce you to new series to love. Download your copy and tell a bookish friend about it while it’s available!